Pimpri Chinchwad College of Engineering, one of the leading institutes in and around Pune, believes that Quality is always a result of strong intentions, dedicated efforts, appropriate and intelligent decisions and skillful execution and thus envisions to serve the Society, Industry and all its Stakeholders through Value Added Quality Education. The world of 21st Century has become a global village owing to impact of globalization, liberalization and privatization. Today the corporate needs knowledge manpower and solution providers and not mere subject experts. This has created a dire need for budding technocrats to possess professional skills like critical and innovative thinking, problem solving attitude, communication skills, professional and social ethics besides technical expertise. The four pillar philosophy of PCCoE is very much in line to this changing industry, corporate and societal need and strongly focuses on Academic Excellence, Innovation & Research, Professional Competence and Social Commitment. To achieve Academic Excellence, we weave together diverse student community embedded with sound academic fundamentals and highest standards of quality, honesty and teamwork. We function as per P-D-C-A cycle and have well defined and stringent teaching learning process with continuous monitoring and control leading to excellent academic results. Our Outcome Based Education philosophy and the fine blend of young and dynamic faculty of the institute who strives to foster and encourage various innovative teaching methodologies that are both practical and theoretical in approach nurtures project and activity based learning culture further contributes to academic excellence and research initiatives. “Engineers are the creators of the new world”. Going with these lines, PCCoE is constantly making endeavors to create an Innovation & Research conducive environment and our well established R & D cell further stimulate innovation among students by inspiring them to create novel ideas and give solutions to the contemporary and emerging issues in engineering domain and identify new directions for future research and development. Engineering is dynamic so it needs professionally competent people who can work across disciplines with others, and continually adapt to new challenges. We are conscious of this fact and expect our students to stand out distinctly different from others. PCCoE attempts to manifold shades of learning through co-curricular and extra-curricular activities to instill within the students necessary skills and knowledge to groom their overall personality, make them corporate ready, imbibe entrepreneurship skills and competency to take up the challenges in the competitive scenarios. Besides technical and professional competence, we make every possible effort to equally imbibe in them the moral and ethical values and transform them into good human beings with these values embedded for life. We nurture in our students the sense of social commitment, humanitarian values, ethical practices and professionalism and thus endeavor to make them global citizens who can look beyond geographical boundaries and become good social and responsible citizens of the society. 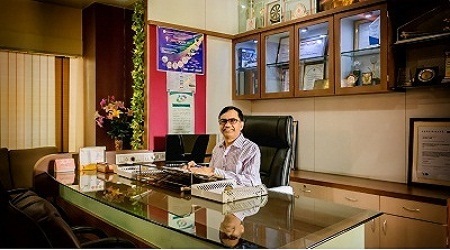 I am glad that PCCoE that started in 1999 has today become a well recognized technical institution for imparting quality technical education owing to the constant, sincere and dedicated efforts of Team-PCCoE who have been channelizing all the efforts towards strengthening of these four pillar and the outcomes are evident. Today we hold a good position in university in terms of academic results, have more than 110 patents and 700+ research papers of students and faculty in renowned journals, research grants for our faculty, collaboration with industries and organizations of repute through MoUs and excellent placement in core and IT companies. This gives us a realization of our strength and affirms the success of our four pillar philosophy. However, as the Head of Institute, I still believe that this is just the beginning and through a strategic roadmap, we are committed to grow further in new dimensions to seamlessly fit into the global fabric and be at par with the global standards of excellence. This roadmap focuses on our broad objectives of further creation of the requisite infrastructure for the expansion, strengthening of faculty competency and laboratory and research facilities that not only addresses the requisites of curriculum but opens new frontiers for research in emerging domains and envisions the creation of incubation centre to enable entrepreneurship and value creation from the research and innovations leading to cutting edge research. Strengthening of linkages with industry will further motivate students and faculty to take up real life technical challenges and ambitious research projects and will also fortify our placement and entrepreneurship initiatives. On this platform, I make an appeal to all Industry Professionals and other valuable stakeholders to join hands with PCCoE to align our efforts towards a set of common goals so that the sum of our efforts and achievements is much more than our individual contributions. I also appeal to my entire Team-PCCoE to explore their potential to the fullest in this invigorating work environment where merit and hard work are recognized and acknowledged. PCCoE leverages the strengths that it has developed over the past decades, build upon them and acquire new strengths and would like to emerge as a prominent hub in technical education and research thereby contributing to the social and global initiatives.